Animal Wildlife | Sloth | Sloths are tree dwelling mammals that pass their time sleeping and eating.The sloth happily eats both plants and insects,and occasionally small reptiles and birds.The sloth is indigenous to the jungles of central and south America,with the general opinion being that the sloth cannot survive outside of this specific habitat. The average sloth tends to be around 50 - 60cm long with a short tail of around 7cm in length. The body temperature of the sloth is usually around 30 to 34 degrees celsius (86 to 93 degrees fahrenheit). 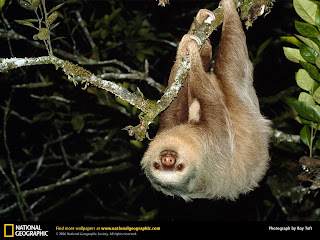 There are two main species of sloth, the two-toed sloth and the three-toed sloth. 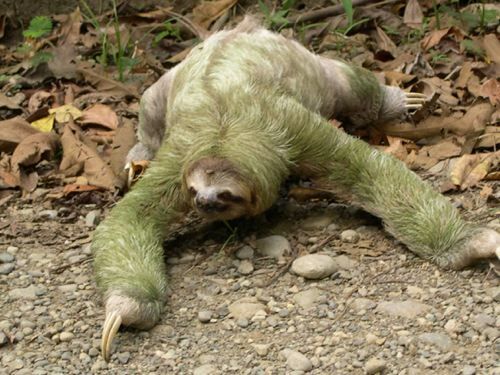 It is thought that until recent times, larger ground sloths inhabited the jungle floor of both North and South America. As with many animal species around the world, the ground sloth is thought to have become extinct around the same time that human settlers went to these parts of the world. Although sloths have an omnivorous diet and eat both plants and animals, the majority of the sloth's diet is made of leaves. 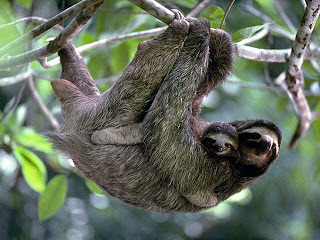 Leaves contain very little energy and nutrition so the sloth has adapted to have a large and complex digestive system in order for the leaves to pass through the sloth effectively. Sloths have long, sharp claws which they use to get good grip when they are climbing trees or hanging from branches. 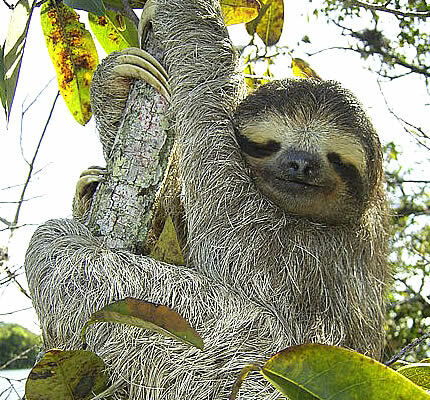 The sloth is a slow moving animal, and their long claws are the only form of defence that the sloth has. Sloths attack predators or threats by swiping at them with their claws out. Sloths are prey upon by jaguars, large birds of prey, snakes and humans.